I recently saw this necklace highlighted in a magazine. It immediately struck a chord with me because I agree so strongly with the sentiment it expresses. I thought about ordering one but decided against it as I am drawn less and less these days to owning things. Plus I am not sure how it would go with my fall wardrobe (haha). 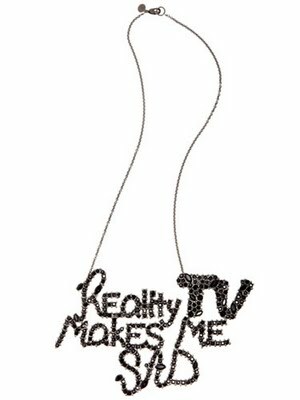 Reality TV does make me sad. When you were young, did you want to be known for something? Maybe breaking the homerun record, curing a disease, creating the ultimate computer game, or perhaps holding a political office? The people who accomplish these types of wonders (yes, there are even some very good people in political office) are the ones who until recently got a lot of our attention. And while one could argue that the level of adoration given sports figures has always been a bit much, they do illustrate what can be accomplished when you work hard, focus and develop your particular brand of genius (we all have one). But now we have a new type of celebrity. Rapt attention is given those willing to be in front of the camera or worse, degrade themselves in front of the camera. Sometimes it’s in a highly edited competition with competitors selected because of their attractiveness or caustic personalities. Sometimes it’s people filming themselves when they shouldn’t be. And the two feed on each other. It’s a group of people who are famous not for contributing to society —or to anything of worth — but who are simply famous for being famous. Damn this makes me sad. Because I know so many people who are doing very real things every day that make a positive difference. In a way, it also makes me happy. Happy because I have a job I believe in, where I help give the limelight to people who truly deserve it. They deserve to be appreciated for being hyper smart and intelligent — as well as practical, resourceful and hard working. Not the character traits you find in most reality TV stars. But they’re the qualities that really count. So if Reality TV Makes Me Sad, then Wisegate Makes Me Happy. Now there’s a necklace I could wear.